A couple of months ago, I was enjoying the last day of my vacation sitting on a balcony overlooking the ocean. The day was beautiful and there was a family below us on the beach, the children were playing in the sand and exploring the shells and creatures that had been washed up on the beach. All of the sudden, I heard a blood curdling scream followed by the cries of a child in distress. I looked down and saw the father running towards the water, throwing off his shoes and pulling up his pant legs. My first thought was, oh no! One of the children was struggling in the water. The rest of that family all began running, behind the dad, to the shoreline. As my mind focused on what was really happening, I sat back in relief and wonder. Why was the child screaming and crying so loudly and in such distress? Because her hat blew off of her head and it was floating away in the water. Her dad, jolted by the screams, and seeing what happened, jumped in and saved the day! He caught up with the hat, grabbed it out of the water, and placed the wet hat back on his daughter’s head. The baby boy, who was playing on the shore with his sister, was so frightened by her screams that he became unconsolable. The family all seemed so upset and visibly shaken. However, after about 3 minutes, the little girl and her baby brother were playing happily in the sand again. The rest of the family was sitting in beach chairs and appeared to have forgotten what had occurred and everyone was happy again. I thought, “wow” all that over a little hat. I then sat back and reflected on my own life for a minute. I realized that we often act similarly to that little girl when we lose something, or something does not go as we had planned. We get upset, some of us may scream, cry and carry on. We rush to replace it with something else, something that makes us temporarily happy. We are only human and we have emotion. But, at what cost? Can this loss actually be a benefit? I sat on the balcony and thought back to times when I had lost something that, at the time of the loss, was very upsetting. I realized that after a while, the loss is forgotten, or kept in my memories, but it no longer bring about that intense sadness or grief that occurred when the loss was in the front of my thoughts. A passing sadness at a memory, a tear shed? Yes. But the intense sadness and grief is no longer present or will soon subside. Do we not realize that our losses, things that we hold dear to us ( often material items or relationships), are just a temporary illusion. If that little girl’s hat had not been retrived, that family would still go on with their lives, a new hat purchased. In fact, the hat that was retrieved from the water will eventually become worn and tattered. It will have no use. I now know that, even when I experience loss, even when it hurts me to the core, I know that this loss is Allah’s will. I may never understand why Allah gives me that particular trial, but I know that if I deal with it with patience, seeking His help and guidance, I will be ok. Maybe that experience, that person, that material delusion, is not good for me and will be replaced with something better. And, my sins will be forgiven through my patience and acceptance of Allah’s decree. Do I want to be happy, healthy, safe, and comfortable in this life? Of course, we all want that. We all want to experience happiness and comfort. But, we cannot always be comfortable. If we are always comfortable, we tend to forget. When we are faced with loss, with hardship, with sadness, or despair, remember that these trials are gifts. At the time that they occur, we are certainly not feeling like we received a gift. But, we do know that Allah tests us often. And, He tests those who are firm believers. Tests are hard, they disrupt our lives, they cause distress, anxiety, sorrow, and grief. However, these tests, if we live and learn patiently through them knowing that they are Allah’s decree, will be rewarded by forgiveness of our sins. Do we not want to meet Allah without our sins held over us? “Hardships continue to befall a believing man and woman in their body, family, and property, until they meet Allah burdened with no sins” (At-Tirmidhi). It is important to Remember Allah often! We must do our daily prayers, we must make dua, and we must make dzikr often. Everyday! Don’t wait to Remember Allah only when calamity strikes. We must be content and have patience with Allah’s trials. When Allah loves someone, he tries them. SubhanAllah, our trials are actually our blessings. Although we often can’t see the blessings through the fog of the trial, we have to remember Allah SWT and be patient. Patience with Allah’s SWT decree, not patience with how we handle the situation. If we are placed in a trial, we must reflect on how we can move past it with Allah’s guidance and support. Will our trials be easy, be free of distress and grief? No, they won’t. But, our job is to accept Allah’s decree, be patient with His decree, and seek out His Help, His Forgiveness, His Mercy. Our beloved Prophets, (RA) suffered more trials than any other people who lived on this Earth. Their faith in Allah SWT was notable to all who were in their company. And, when calamity struck, they sought Allah’s help right away. They were put through trials of the disbelief of their own families, of war, of poverty, of ill health, and of attack, but their faith remained. 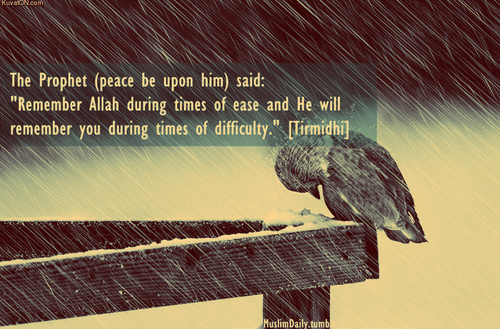 So, when we are hit with a calamity, a trial, a sickness, or other hardship, remember Allah SWT. Remember him abundantly and seek His forgiveness. Would you not want to be subjected to some trials in order for your sins to be forgiven? It is also important to not become jealous of what others have been given. What others are given is also Allah’s decree. It is what the one who has been given something you had wanted does with that blessing, to understand where that blessing came from in the first place. If they think that it is only from their hard work and of their own hands, they are very mistaken and will not receive the true reward and blessings of what they were given. “And whatever of blessings and good things you have, it is from Allah” [al-Nahl 16:53]. On the authority of Abu Abbas Abdullah bin Abbas (RA) who said: One day I was behind the Prophet (SAW) [riding on the same mount] and he said, “O young man, I shall teach you some words [of advice]: Be mindful of Allah and Allah will protect you. Be mindful of Allah and you will find Him in front of you. If you ask, then ask Allah [alone]; and if you seek help, then seek help from Allah [alone]. And know that if the nation were to gather together to benefit you with anything, they would not benefit you except with what Allah had already prescribed for you. And if they were to gather together to harm you with anything, they would not harm you except with what Allah had already prescribed against you. The pens have been lifted and the pages have dried.” It was related by at-Tirmidhi, who said it was a good and sound hadith. Be mindful of Allah SWT. When your hat blows away, don’t rush to replace it. Wait for the blessings and be thankful. ← ALLOW YOURSELF TO BE UNCOMFORTABLE!